Paul's Easter Challah - we used the challah recipe from Peter Reinhart's bread book and we found that it was too dry. So no recipe for today, but I thought it was pretty to share. In the future, I would have mixed the food coloring into the liquid mixture when making the bread (in this case the liquid mixture was eggs + water + oil). 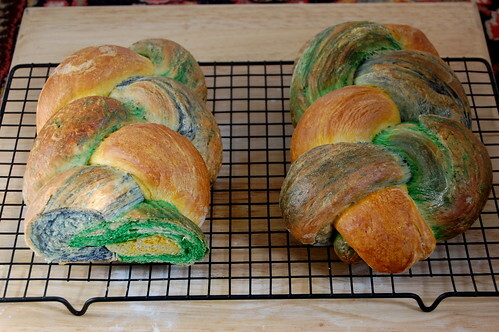 We tried to knead the food coloring into the dough after it was formed and it didn't quite distribute evenly. 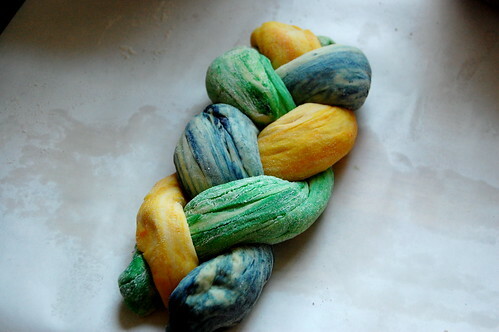 Hahaha, Mercedes...The photos of your dyed Challah looked like a luscious hand-dyed braid of wool roving to me!! I find the colours fascinating, particularly as they show in the first picture:-) Did you use "standard" food colouring or some more elaborate colouring agents? Nope just regular old food coloring, although I did contemplate whether using paste food coloring would have been better. And yes! It totally looks like wool, or play-doh, or something silly, that's why I had to post it! And how did it taste?